The Omnitest plus blood glucose monitor consist of a sensor system for measuring blood glucose in capillary blood. The Omnitest® plus system provides a quick and easy way to measure the blood glucose level. Omnitest® plus could be used for self-monitoring of blood glucose level by diabetes patients. It should be used only for testing blood glucose (sugar) and only with fresh capillary whole blood samples. 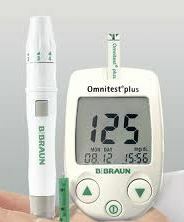 It should not be used for the diagnosis of diabetes or for the testing of newborns (neonates). Do not use Omnitest® plus system for any purpose other than blood glucose test. The Omnitest® plus system is intended for use outside the body (in vitro diagnostic use only).